Not the Hilton but a cozy mountain top cabin nestled in the woods very close to nature with fireplace and hot tub! A beautiful view of the Shenandoah Valley and back yard borders National Forest. Hiking, fishing, kayaking, and exploring only a short drive to the Shenandoah River and Luray caverns for outdoor fun! If you like the great outdoors this is the place for you! Great hiking less than a few minutes away! Plan your day's activities on the Shenandoah River or over to Shenandoah National Park and Skyline Drive or explore Luray Caverns and the quaint town of Luray. In the other direction you have New Market with historic battlefields and other Caverns to explore. Wineries and vineyards are in both directions. So much to do so plan lots of time or just relax and enjoy the mountain air and hot tub. In case of wet winter weather you will need an all-wheel or 4 Wheel Dr. vehicle to make it up the driveway. 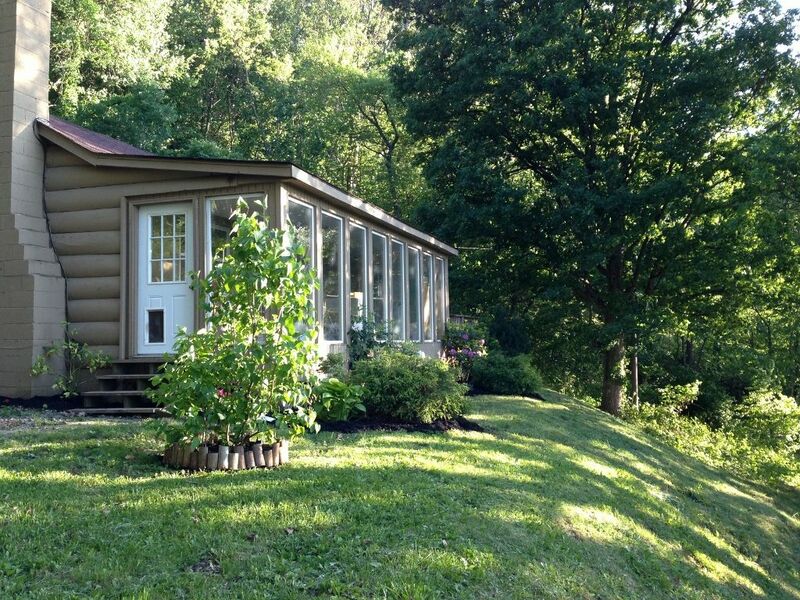 Keywords: fireplace, hot tub, views, river, full kitchen, Luray, Shenandoah River, Luray Caverns, Shenandoah National Park, Log Cabin with Hot tub, 2 bed room, one queen, bunk beds with two twins, pull out-sofa, sleeps up to 6. One bathroom, Living room and kitchen are open. Kitchen is fully stocked. Gas log Fireplace, Dishwasher, Washer and dryer, Refrigerator, gas stove, Front glassed-in porch, side deck with patio furniture and umbrella, grill, outdoor fire pit. My husband and I are local from Luray, Va. We have a beautiful baby son, and two dogs. We love our family time together, and we wanted to have a place where others could have family times and enjoy the cool mountain air. We used to live in this cabin until we out grew it when we had our son. We loved the cabin so much we couldn't part with it. So we decided to let other families enjoy it too! Minutes from Luray Virginia with the world-famous Luray Caverns, restaurants, boutiques, and antique shops. Minutes from New Market Virginia with a Civil War battlefield. coffee, tea, spices, salt, pepper, sugar and cooking oil. This is a mountain top cabin that has fresh spring water. With beautiful night sky views and a hammock to relax in the cool summer nights. The mountain is normally 10 degrees cooler than the valley so it makes for a cool retreat in the heat of the summer and a winter wonderland. Amazing view from a cozy, welcoming cabin! The area is just beautiful! The cabin was great with all the accessories you can think of! The hot tub was an amazing end to each night! Really enjoyed our stay! This cabin is the perfect combination of rustic chic. Everything was clean and functioning. Kitchen was well stocked with cookware. The owner was attentive. Cabin felt like home away from home. Hot tub was wonderful. Would love to revisit. We had a wonderful time at Brandi's place! It is so peaceful and cozy, and the hot tub is a wonderful addition. The kitchen has everything you could need for a comfortable stay and Brandi was extremely helpful during our time there -- she even popped by to help us get the fireplace up and running when we were struggling with it. Brandi was a welcoming and kind host and we definitely plan to return for a longer stay another time! Great little place in the woods, very relaxing. We enjoyed the proximity to Shenandoah national park and great hiking. We loved quiet evenings in front of the fire and in the hot tub under the stars. This was exactly what we were hoping for. Nearby all the best attractions at Luray and Shenandoah National Park. Cozy and comfortable cabin. Brandi was VERY accomodating and went beyond expectations for making sure our stay was stress free. Luray Caverns, Luray Caverns garden maze, Luray Zoo, Skyline Drive, Shenandoah River, Wisteria Vineyard, New Market Battle Field, James Madison University, Shenvalee Golf, local hiking, Shenandoah River Outfitters (tubing, canoeing, kayaking), Lake Arrowhead, Shenandoah Caverns, American Celebration on Parade, Massanutten Skiing, Bryce Skiing. Rates are subject to change until reservation is confirmed. Towels and Sheets are provided upon request with an additional fee of $50.